I was planning to write on my tendency to view people moving more slowly than me as not only obstacles but outright enemise. Morons, idiots, retards, cripples, etc. I have extremely ill natured thoughts about strangers who are doing nothing but walking. This is particularly common in New York and is maybe analogous to road rage. Other people get depersonalized, and the only thing that matters is moving from my path. It's my right of way, and wherever you may going, whatever you may be doing should be subservient to my needs. I could probably go on about how this may be a particularly American attitude but something has come up. Or rather, something has gone down. A delicious gyro has gone down my throat and into my gullet. Even the most bewildered, camera brandishing, weaving and walking five abreast tourists might be safe from my sidewalk rage now. A gyro, slathered with cucumber and hot sauce, stuffed with shavings from the mystery beef, sprinkled with lettuce and tomato, and complemented by french fries, is the perfect meal. I just finished one and my description is making me hanker after another. Gyro, I love to eat. I have a theory that the word "hero," a regionalism to describe what is elsewhere termed a sub or grinder, derives from the greek "gyro," which, when properly pronounced, sounds an awful lot like hero. I have no evidence for this theory, however. 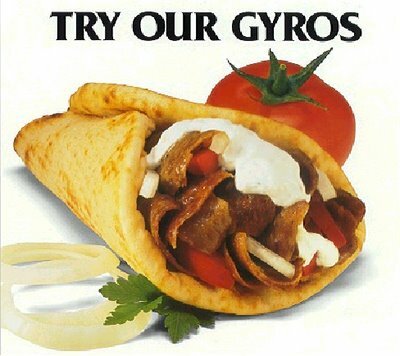 Only fond memories of a fantastic gyro. That poem is freaking awesome. Hot sauce, white sauce, yum yum yum. Hey hey gyro, comeon and get sum. The last's bittersweet, but there's always next time. It is so weird how uptight I and others get when driving. A trivial aspect of life: do I get to my destination a few minutes later? Yet I can get so angry. I've been in the car with people who get much angrier than I do, cursing at every car that dares to pass. I content myself with bemoaning others' flouting of the law. (Interestingly, I am not so critical of myself when I flout the law.) But the fact remains, why does something so ordinary as driving cause people to become so angry?